So when exactly was it that enough people thought diving into water-filled passages (with very questionable equipment) was a good enough idea to form a club? It was in 1946 when the Cave Diving Group, better known as the CDG, was formed at the resurgence of Ogof Ffynnon Ddu in South Wales by the late Graham Balcombe. This makes it the oldest surviving diving club in the world! The CDG's origins can be traced back to the 1930s in the Mendip hills of England where the first recorded cave dive was made in Wookey Hole. This cave, part of which was made into a commercial show cave in the 1920s, is considered the birthplace of cave diving. While there have been numerous dives into caves using the Hard Hat style apparatus (1878 -- dive into the Fonaine de Vaucluse), it is fairly safe to say that cave diving was born in the subterranean River Axe. On February 17, 1934, Graham Balcombe and Jack Sheppard carried a homemade respirator to a sump at the end of a cave named Swildon's Hole on Mendip. Although they failed in passing the sump, the objective was to push the sump, which had helped increase exploration since 1921. The homemade respirator, made of bicycle parts, was portered through the cave, which was the deepest British cave at that time, past two wet pitches to the sump. It took these pioneers another two years to pass this sump, but the seeds of cave diving were sown that day. In 1935 these same explorers mounted the Wookey Hole Expedition. Using base-fed air lines and bottom walking technique, they were able to pass the sump in the Fourth Chamber to find the Fifth, Sixth and Seventh Chambers. In November of 1936, Graham Balcombe made the next crucial step in the development of cave diving. Using his homemade bicycle respirator, he attached an oxygen cylinder and passed Sump Two in Swildon's Hole. In doing so he became the first self-contained cave diver. As it turns out, the Swildon's stream feeds the River Axe, which rises from under Mendip at Wookey Hole. In the years following World War II, the River Axe became the cradle of the Cave Diving Group. It was in April of 1946 when Balcombe and Sheppard turned their attention to Ogof Ffynnon Ddu in South Wales. While the great cave hiding upstream was not to yet reveal itself, the two succeeded in recruiting several cavers to the cause. The Cave Diving Group was formed, coordinated on a regional basis with 3 sections: Somerset, Welsh and Derbyshire. Since then, the CDG has become known throughout the world as one of the best sources of sump diving knowledge. Today the CDG has its own training (apprenticeship) and examination system, although is not an accredited certifying agency. 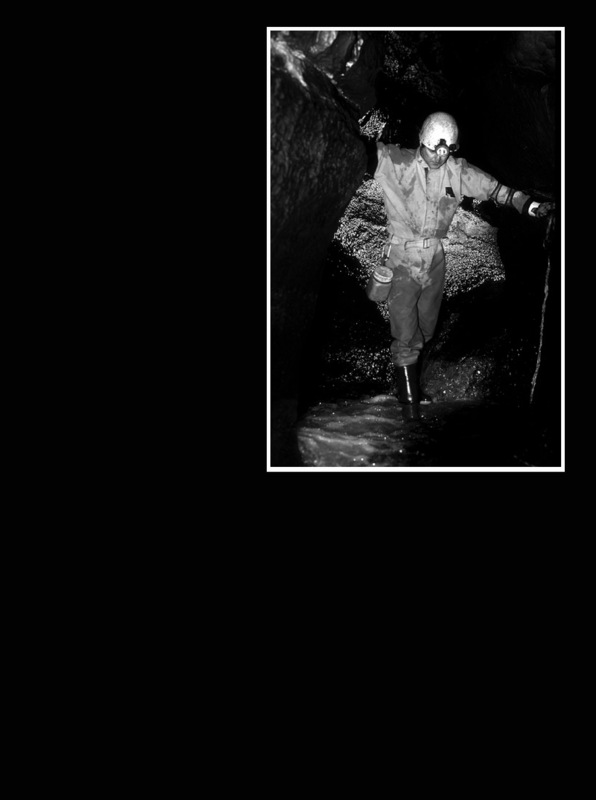 Cave diving in England is not so much a branch of technical diving, but more a form of technical caving. The nature of operations beyond sumps requires the cave diver to be proficient in all aspects of underground exploration: climbing, rope-work, surveying, digging, photography and particularly first aid.  Non-Diving members: This category is typically meant for members resident abroad.  Probationary Trainee: One who doesn't hold a recognized diving qualification (BSAC, etc) and hasn't passed the pool test would fit into this level. This phase is aimed at producing an individual competent in the use of SCUBA. 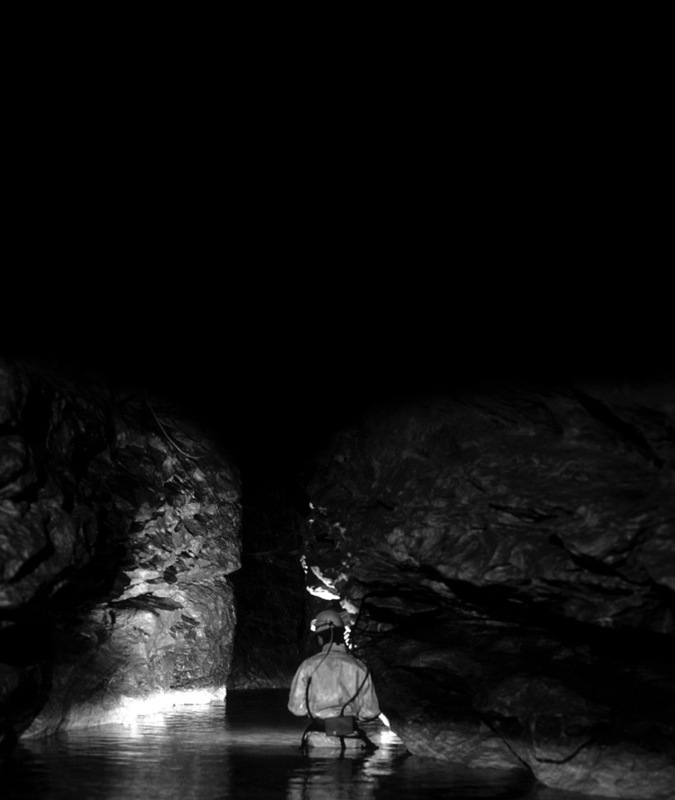  Trainee Diver: This level is for those training for actual cave dives. The use of side-mounted cylinders, line laying and other overhead techniques are taught. The trainee diver progresses to actual cave dives (under supervision).  Qualified Diver: The Qualified Diver has passed an Advanced Test with an examiner from their section. Qualified Divers are full voting members of the Group and are eligible for election to the post of Examiner by the section; normally, only enough Examiners are appointed to satisfy the demand for Pool and Advanced tests. In order to move up to the next qualification level, one must be voted upon. This gives all members a chance to voice potential concerns over a new member's skills or general attitude. While it may seem excessive, the safety record of the CDG is quite impressive, especially considering the general conditions of sumps in England and Wales. The CDG is administered nationally via a central committee, but the divers belong to one of the four sections: Derbyshire, Northern, Somerset and Welsh. The section one joins would reflect the area in which their caving/diving is primarily conducted. Having mentioned that the CDG is not a recognized certifying agency, they are also more than what we would normally consider a 'club' in the United States. When looking at the contents of the CDG training manual (which all members must have), one will see everything from openwater skills to long-distance sump diving and passing through tight sumps. Caving beyond the sump and first aid beyond long sumps is also covered. In the equipment section there are boot suggestions (for caving after the sump) and compressor information (there are few fill stations available). Underwater digging, DPVs, rebreathers and survey techniques are also listed in the manual. During the Wakulla II Project, membership in the CDG as a Qualified Diver was said to be the highest certification level possible. This, perhaps, puts the nature of the CDG training in prospective. This is not to say that formal technical diving certification training is not available in the UK. In fact, technical diving certifications have recently gained in popularity. TDI, and to a lesser extent IANTD, have been available although not used by mainstream cave divers in the past. This is typically due to the fact that the techniques necessary to dive many of the sumps and to reach the second, third and further sumps are not available in this training. There are sidemount/sump specialists, such as Martyn Farr, who offer training in these disciplines, but in general the skills are developed within the CDG itself. Global Underwater Explorers (GUE) UK has recently established itself, which teaches the D.I.R. (Doing It Right) principle developed by the WKPP in Northern Florida. Agencies of this nature teach mainly resurgence -- or spring cave diving -- where caving beyond the sump is not an issue over which to be concerned. This training focuses more on long range and deep diving techniques than on sump/caving skills. The future of the CDG likely resides in a combining of the two techniques. This is not implying that all sump divers will become long range deep cave divers nor vice versa. Instead, the CDG is faced with adding a new facet of technical divers into their membership. This would mean having non-caving members in the CDG. This is somewhat controversial, as the CDG was formed by a group of cavers' desire to pass sumps in exploration of passage, which would otherwise elude them. Cavers became cave divers out of necessity, not the other way around. The reasoning behind this is fairly obvious. If one is to participate in an activity as dangerous as sump diving, that person should prove him-herself competent in the more forgiving world of a dry cave. It should be pointed out that while the CDG typically focuses on cave exploration and survey and not on long range deep cave diving, there are a few members who excel at both. 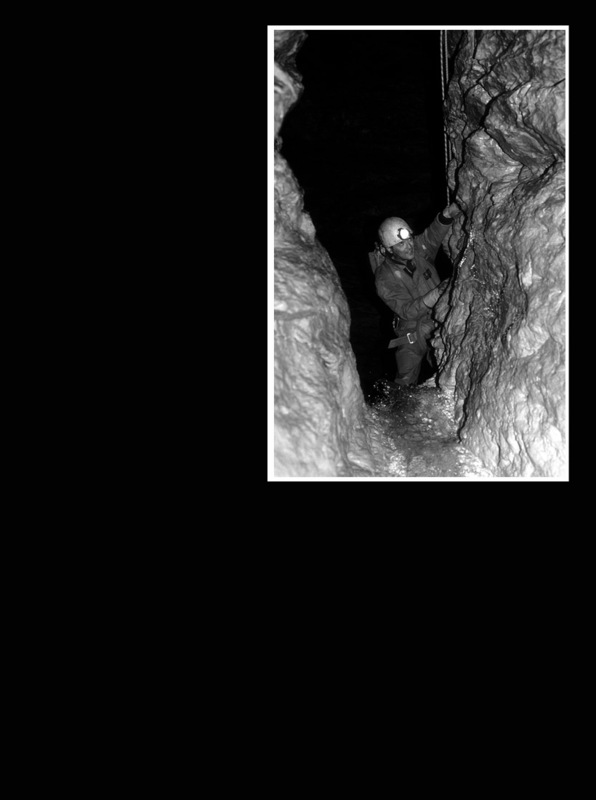 Many of the deep caves found in Southern France and Spain have been pushed by CDG members using rebreathers and long range scooters. 1935	Balcombe and Powell reach Chamber Sseven, Wookey Hole, using Standard Equipment. 1936	Sumps One and Two, Swildon's Hole, passed using homemade respirator (made of bicycle parts and oxygen cylinder) and a homemade drysuit. 1945	Kelt Head is explored using oxygen rebreather apparatus. 1946	First dives at Ogof Ffynnon Ddu lead to the formation of the CDG! 1957	SC Nitrox rebreather is used to push Wookey. Suit inflation in drysuit is developed. 1960's	Open circuit compressed air gains widespread acceptance. Introduction of wetsuits and fins (previous dives were made bottom walking). 1970's	Long sump pushes in Kelt Head, Wookey and others. Many tragic deaths occur during this time frame. 1980s	Long deep dives become possible with the re-introduction of the dry suit and experimentation with mixed gas. 1990s	Mixed gas gains slow acceptance. Rebreathers begin to reappear. Underwater digging becomes common. 2000	Using redundant rebreathers and long range scooters, huge systems are pushed (Ressell, Doux de Coly, St. Savuer, etc). 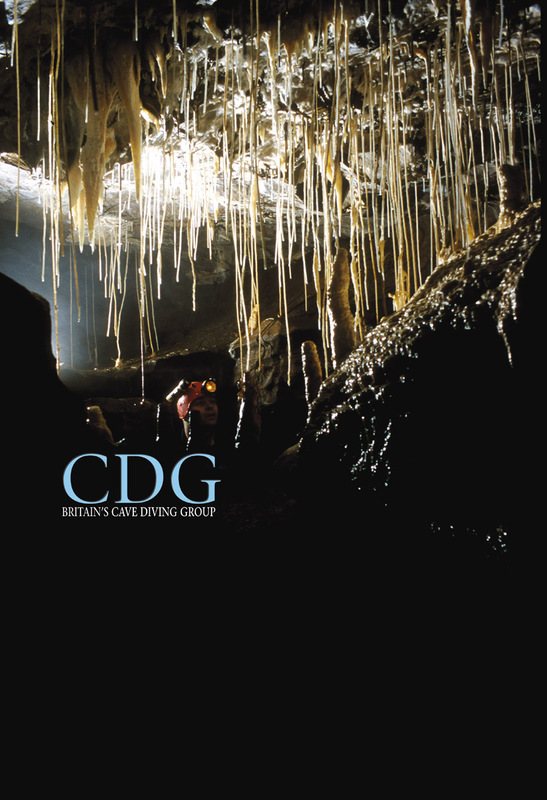 The history behind the CDG and, in effect, the creation of the discipline of cave diving itself is filled with great pioneers. So many, in fact, that to even briefly mention all the notable accomplishments would take a small book. Their attitude and mindset to overcome obstacles is apparent. It is this spirit that drives the future. More than anything this is what needs to be carried forward. The Cave Diving Group, the oldest of all diving clubs in the world, will continue to produce pioneers of tomorrow. Special thanks to Tim Morgan, Duncan Price, Rick Stanton and to all members of the Welsh Section of the CDG.